The Floyd County Prosecutor’s Office filed Habitual Offender or Habitual Substance Offender charges on 58 defendants during the 2010 calendar year. According to Indiana Statute, the State may seek to have a person sentenced as a Habitual Offender for a felony offense if that person has accumulated two or more prior unrelated felony convictions and certain other conditions apply. The State may seek to have a person sentenced as a Habitual Substance Offender for any substance offense by alleging that the person has accumulated two prior unrelated substance offense convictions and certain other conditions apply. The habitual offender statutes provide the trial court with the opportunity to impose a more severe sentence on offenders who choose to pursue lives of criminality. 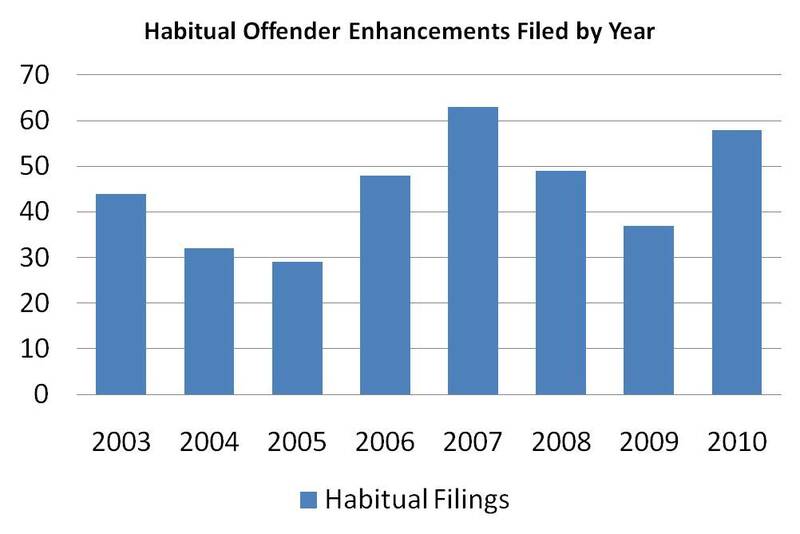 Habitual Offenders can be sentenced to 1 X the advisory sentence for the underlying offense at a minimum, through 3 X the advisory for the underlying offense (30 year maximum). Habitual Substance Offenders can be sentenced to 3 additional years at a minimum (1 year if there are more than 3 years since the last prior offense) and to an additional 8 years at a maximum.